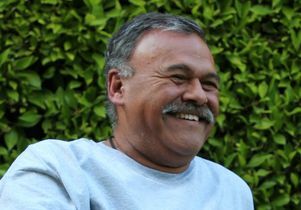 UCLA staff member Frank Lopez lost more than 65 pounds through the campus’s diabetes prevention program. Frank Lopez knows how tough it can be to change old habits. Not long ago, eating two large burritos in one sitting or spending his evenings sitting on the couch and watching television with a cold beer in his hand was common practice. But following a serious conversation with his doctor six months ago, Lopez, who manages publications and graphic design at UCLA School of Law, was diagnosed with Type 2 diabetes. 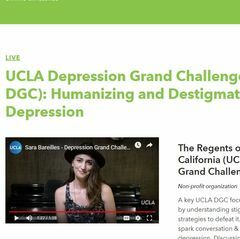 Fortunately for Lopez, a colleague told him about UCLA’s diabetes prevention program, which was launched in 2016 with financial support provided by the Semel HCI Center at UCLA to subsidize program fees for UCLA students, staff and faculty. 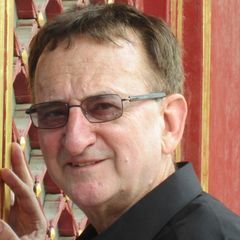 The program, which is part of the Centers for Disease Control and Prevention National Diabetes Program, is designed for people who are at risk of diabetes or who have been diagnosed as being pre-diabetic, although in rare cases individuals already diagnosed with diabetes have been permitted to enroll. With his doctor’s blessing, and that of program organizers, Lopez signed up immediately. “I needed a road map and I didn’t have one, other than what I was seeing online. There’s a lot of information and it’s hard to know what to follow,” Lopez said. The program features hour-long, in-person sessions scheduled through one year. To date, 82 people have completed the campus program, with about 70 more enrolled at various stages. Sessions are led by trained UCLA staff members and enrollment is offered each month. UCLA is among the first universities in the country to offer the program as part of its employee health and wellness efforts. UCLA’s success also inspired the University of California Health system to offer funds to each of its 10 campuses to launch two-year pilot versions of this program. UCLA, UC Davis and UC Riverside each launched free campus programs this fall. Four additional campuses are preparing to roll it out in 2019. “At UCLA, we are often setting the benchmarks for what employee wellness can look like in a larger setting, so being able to set the standard by offering these programs to combat this diabetes epidemic is huge because we’re showing others that it’s feasible and can be successful,” said Kelly Shedd, who is overseeing the UC diabetes prevention program and serves as assistant program director for UCLA FitWell. Participants track their progress through weigh-ins and reporting the amount of exercise they are completing each week. The goal is for participants to lose 5 to 7 percent of their body weight overall and exercise a minimum of 150 minutes per week. Classes are administered in small group settings and focus on nutrition, exercise and healthy habits. Lopez said he typically isn’t “much of a joiner” but being part of a group like this helps to keep him motivated and accountable as he gets used to his new lifestyle. He also subscribed to UCLA’s MoveMail, which offers a twice daily dose of nutrition and exercise tips. Since joining the program Lopez has lost more than 65 pounds, lowered his A1C level, which measures the hemoglobin in one’s blood and the glucose level attached to it, to a nearly prediabetic range, and considerably reduced his cholesterol and blood pressure levels. In addition to eating better, including enjoying vegetables like Brussels sprouts, cauliflower and spaghetti squash, that he previously avoided, Lopez has started exercising again, something he hadn’t done in years. Now Lopez’s pace is quicker and his route is up to four miles. His lifestyle change and the knowledge he is able to share has inspired his wife and adult children to start exercising more and make better food choices, he said, adding that he is looking forward to everyone getting together for the holidays. He also knows what he needs to do to stay on track and maintain his goals during this time of year. Lopez is just one of the more than 100 million Americans who live with diabetes. A UCLA study published in 2016 found that a majority of California adults have prediabetes or diabetes. Lopez said that although his efforts have not cured his diabetes — there is no cure — he is grateful to have found a way to improve his health. Being able to do it on the job and with the support of one’s employer makes it easier. After learning about America’s diabetes epidemic and the success of those participating in the campus program last year, Peter Angelis, assistant vice chancellor for UCLA Housing and Hospitality Services, pondered what he might do to support at-risk employees in his department. Eighty-eight members of his staff are currently nearing the completion of their sessions, which are held in the housing administration building. Among them is Mary Bower, who graduated from UCLA in 1984 and has worked on campus ever since. 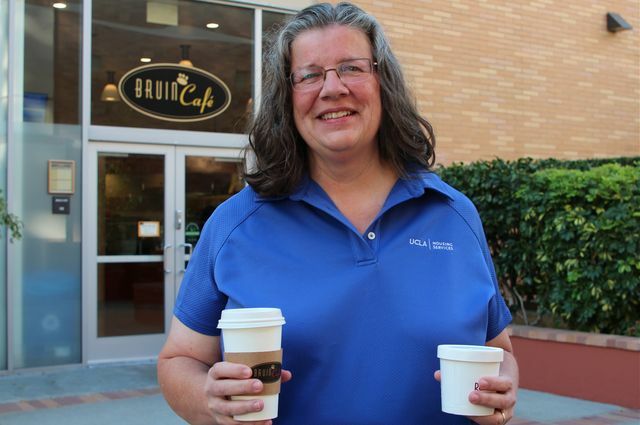 “There’s lots of things at UCLA — ranging from events and concerts and support groups — and to have this offered for free and during the work day is incredible,” said Bower, who enrolled after being told by her doctor that her A1C levels put her in the prediabetic range. Mary Bower has begun making healthier choices when eating thanks to UCLA Housing and Hospitality Services’s diabetes prevention program. Bower, an administrative analyst, said her success was largely rooted in trading poor habits for better ones. For example, her former morning ritual of going to Bruin Cafe to get a latte and a Danish has been modified. 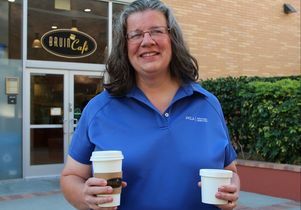 “Now it’s oatmeal and a non-fat latte,” said Bower, who has lost close to 30 pounds since April and lowered her A1C levels to a prediabetic level. UCLA Dining is known as a national leader in campus dining operations, something that Bower said is an asset for those wanting to eat healthfully. Bower said that the small-plate style of food service is also an advantage of dining in the all-you-care-to-eat restaurants in the residence halls, which are served by staff from housing and hospitality services. “You learn what constitutes a normal-sized portion, enjoy it, and realize that was enough,” she said. Bower said having lots of her colleagues in a program where they’re all working toward similar personal goals has made the workplace feel a lot smaller and allowed her to get to know many of them a lot better. It also keeps her accountable, she said.